T-r-e-a-t your pup to our newest addition to our modern dog bowl and or treat jar collection. Our new gloss treat jars and matching ceramic dog bowls are available in four stylish colors. Choose between rose, dolphin, rust or midnight to match you and your pups taste. The ceramic gloss treat jars are 7” x 5” which is the perfect size to hold all of your pups treats (or your human cookies)! 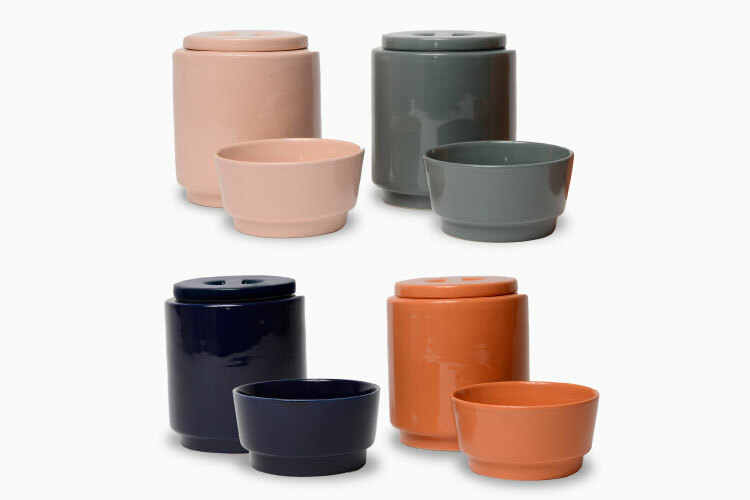 The ceramic modern dog bowls are available in sizes small (2″ x 5.25″, 2 cup capacity), medium (2.75″ x 6.5″, 4 cup capacity) and large (3.25″ x 8.5″, 8 cup capacity) to accommodate your canine friend perfectly. Mix and match colors to make mealtime fun again-MMFA. Just an FYI, both the treat jars and dog bowls are also dishwasher safe, microwave safe and FDA approved for human use if your dog let’s you borrow his new favorite bowl. Be sure to take a look at all of our treat jars and dog bowls here and tell us your favorites. Don’t forget that good boys and girls, deserve lots and lots of treats-always! Previous post:Summer has Officially Arrived! Next post:This Rope Toy is Out of This World!